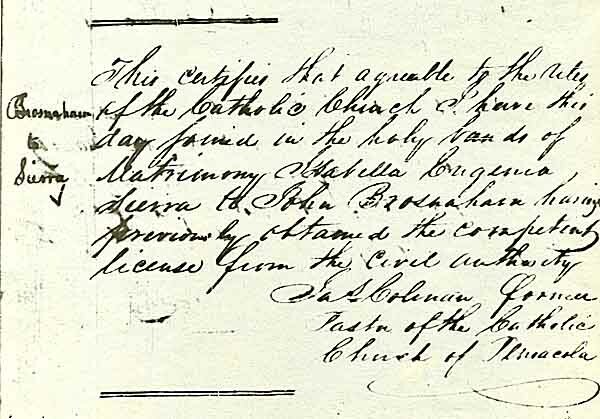 "This certifies that agreeable to the rites of the Catholic Church, I have this day joined in the holy bands of matrimony Isabella Eugenia Sierra to John Brosnaham having previously obtained the completed license from the civil authority." Signed by James Coleman, former Pastor of the Catholic Church of Pensacola. The copy is dated up above on the page: Pensacola, Decb. 30th, 1828. Escambia County, Florida, Marriage Records, County Clerk's Office, [Pensacola], Escambia Co., Florida, Vol. A-F, 1822-1870, FHL Microfilm 941001, Book A, p.36.